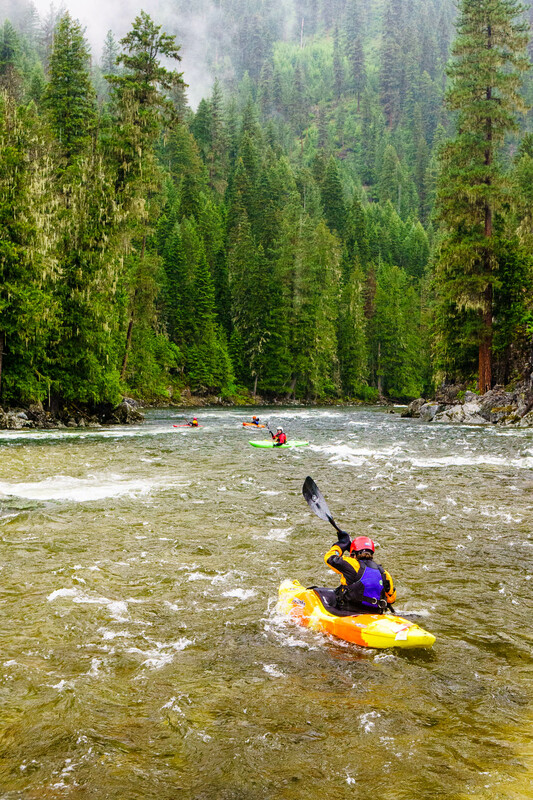 The Selway is a relatively short multi-day with great camping and phenomenal class IV whitewater. It’s also the hardest permit to obtain of the elusive “Four Rivers” lottery system in Idaho. The lottery control season on the Selway runs from May 15 to July 31. It can be runnable outside those windows, but in all but the biggest snow years, it’s too low for hardshell kayaks to float on August 1. It’s a little different from the Middle Fork in that outside the controlled dates, you don’t need a permit at all. If you put on before permit season, you must be off the river no later than May 14th. You can apply for dates during the lottery season with the Four Rivers Lottery — it’s open for applications from December 1st to January 31st each year. That said, good luck — there’s only one private launch per day on the Selway and permits are incredibly hard to win. 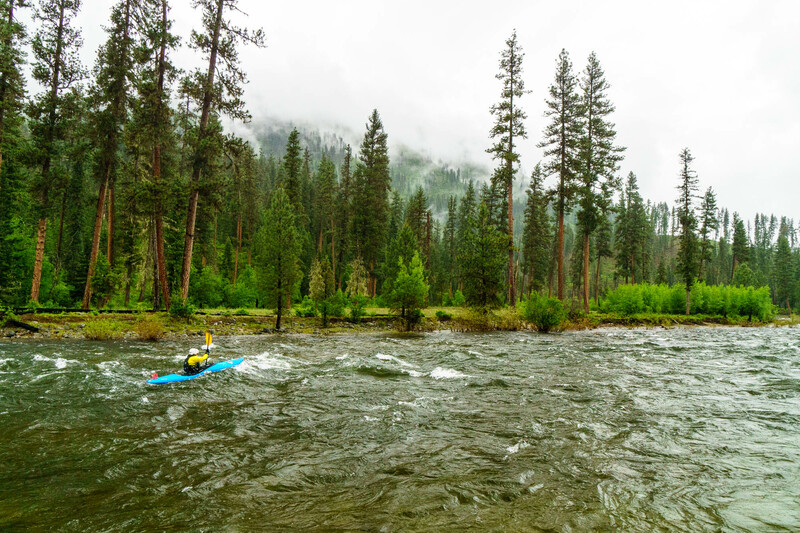 Daphnee Tuzlak on a rainy spring trip down the Selway River in Idaho. Your best bets are to either pull a cancellation during the lottery season (keep refreshing this page) or to go pre-permit season. The system for reserving cancellations has been in flux over the last couple years, so check in with the Forest Service each year to see how they’re handling it. Currently (2018), they’re listing cancellations on the website as soon as they come in, but you’re only able to book them during a two hour window (10AM-12 noon eastern) each day. What this means is that there are probably at least ten other boaters just like you sitting on their computers with three tabs open at 10AM eastern clicking as fast as they can. It can be a bit frustrating, but if you keep at it, you can get a permit this way. 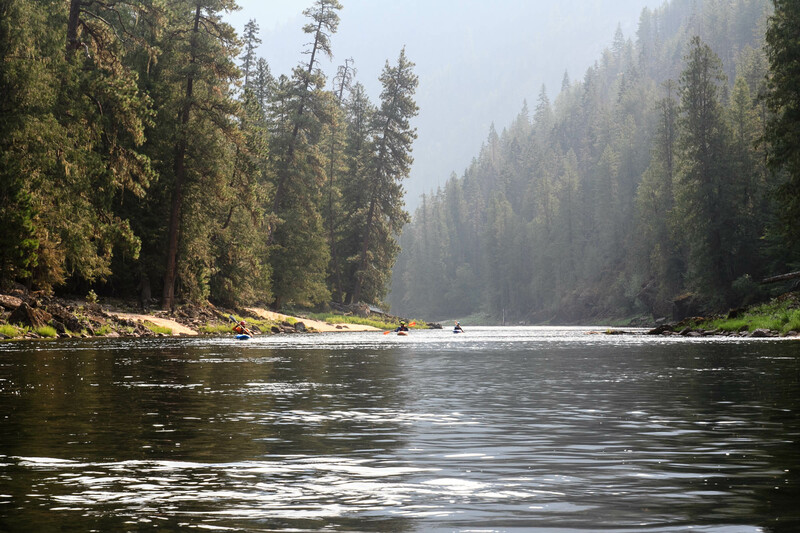 Late May and early June can be a good time to pull cancellations if you’re confident on IV-IV+ big water boating (potentially V if it’s really high) — many people (rafters in particular) are nervous about high water on the Selway and end up cancelling their permits. The biggest roadblock to doing the Selway prior to permit season is the access over Nez Perce Pass to the put-in: it’s sometimes snow-covered well into the lottery season, not just before. It’s possible to arrange shuttle using snowcats or snowmobiles when the road is impassable, but can be quite expensive. Check with local boaters in Missoula for the latest info on options. You can call the West Fork Ranger Station at 406-821-3269 to inquire about road conditions. Paddling on a smoky morning on the Selway. We launched for this trip on August 1 in a big snow year and barely had enough water. Even if the road is passable, shuttle is no joke. It’s about 6.5 hours and 250 miles one-way. I’ve never heard of anyone taking the “shortcuts” that Google shows — I wouldn’t recommend it. 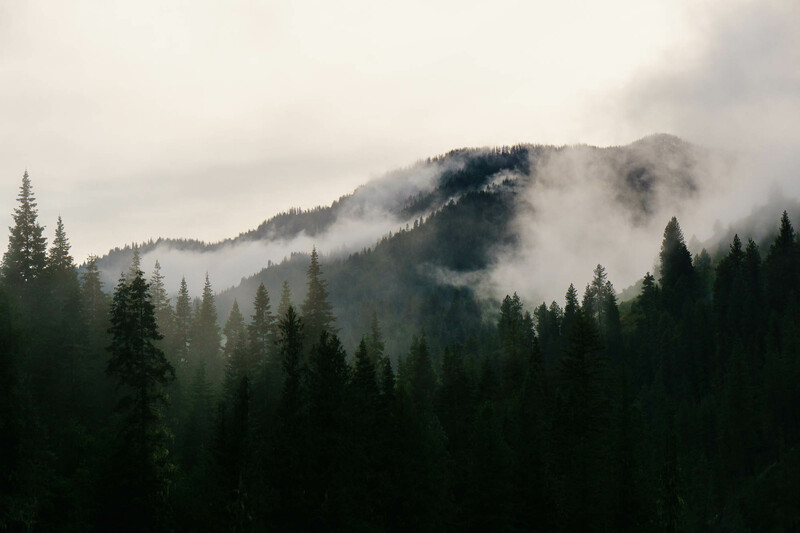 Moody Idaho forest above the Selway. Your paddle and helmet (or cooking pot) can count for the shovel and bucket, but you can’t really get around the other requirements. As of 2017, the Forest Service allowed disposable turkey pans (those deep aluminum pans you can buy at the grocery store) as a firepan. These tend to disintegrate after a single use. It’s definitely better to bring a real break-down firepan, or to avoid having fires every night. Any hard-sided sealable container can pass for an ash container, including a nalgene, plastic bottle, or pelican box. They are pretty flexible about groovers. Have some kind of hard-walled sealable container, or the “wag-bag” system and you’re good to go. I’ve used a pelican box before and I’ve used my Grand Canyon-style 2’ long PVC pipe groover. They are ok with a broad range of poop-systems as long as you can show it to them at the put-in. You can purchase Idaho Invasive Species stickers in advance online or at many retail stores throughout Idaho. Flows make a huge difference on this run. If you’re lucky enough to get on it in early August, it’s likely to be a mellow class III float through crystal clear water with great camping. At medium flows (10,000 cfs), the big rapids are large and powerful, but overall straightforward high volume class IV. As the flows increase from there, so does the difficulty. One section in particular has larger and more continuous whitewater than the rest of the river. You’ll cross under a hiking bridge and see a tributary coming in from river right — this is Moose Creek, and the next two miles contain all the biggest rapids on the run. If you find yourself feeling in over your head and the water is big, it is possible to portage this entire section using the trail on river right. Much of it is continuous enough at higher flows that I’d recommend erring on the side of caution. In general, the river moves quick and you should have no trouble making miles on a shorter trip, even with low flows. Take your time and enjoy the beautiful forests, camping, and whitewater. Heading out from a lunch spot. Note: the takeout is an obvious boat-ramp on river right at Race Track, above an obvious confluence (Meadow Creek) and road bridge. It’s moving flatwater from here to Selway Falls, a multi-stage V-V+ (depending on level) rapid that is infrequently run. Take out above! Water Levels: What is the Paradise Gauge? Meadow Creek, the tributary on river left at the takeout, is a great and rarely paddled class V wilderness multi-day in its own right!